IMPORTANT!! Due to the legislation in accordance with the Registered Club Act 1976, all minors MUST be accompanied by a responsible adult at all times. All minors under the age of 12 MUST be accompanied by a responsible adult in the cinema at all times. Movie tickets for minors MUST be purchased by a responsible adult. Please Note: The Feature starts 2-5min after scheduled start time. 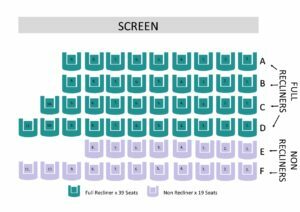 Please consult the seating plan adjacent as to understand the difference in seating types and features. Please note Row A & B are wheelchair accessible.